A self-taught painter, Robert Dickerson was a founding member of The Antipodeans art movement. Inspired by people and scenes of everyday life, his work is often described as melancholy, with isolated figures, menacing dark streetscapes and anguished facial expressions characterising his painting. Dickerson continued to work menial jobs while painting in his spare time, finally becoming a full-time artist in his mid 30s. In 1957 he was commissioned by Australian Women’s Weekly magazine to decorate a Kelvinator fridge for a promotion. It is said he bet the 100-pound fee on a horse race and his winnings funded his move into a career as an artist. 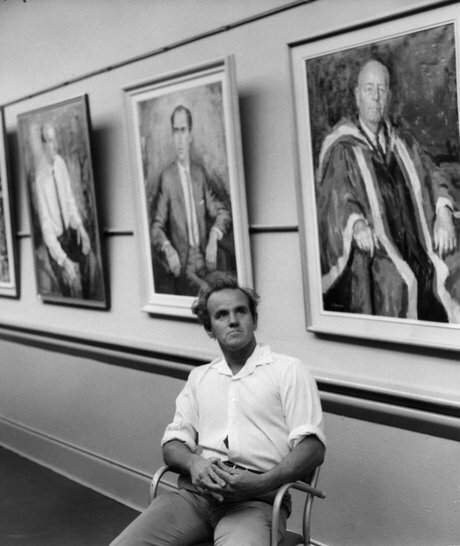 Dickerson came to prominence in 1959 as part of The Antipodeans exhibition, comprising a group of figurative artists including Arthur Boyd, Charles Blackman, Clifton Pugh and John Perceval, among others, who were against abstract expressionism. A portait of Perceval by Dickerson is in the Art Gallery of NSW collection. Dickerson continued to paint and exhibit regularly for the next five decades before his death in Nowra, on the New South Wales south coast, in 2015.